Ser Alliser defends his treason against Lord Commander Jon Snow, and convinces the Night's Watch to side with him. @moonbaseu92 it's definitely Edd getting credit for prisoners - he issues the "throw them into the cells where they belong" order, and basically seems like the Night's Watchman in charge of things Castle Black for now (since neither Davos nor Tormund are Night's Watch members). 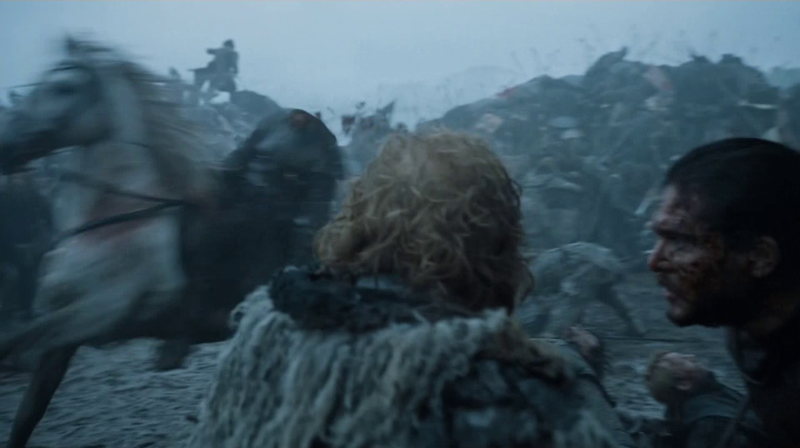 Tormund or Wun Wun definitely won the battle for him, but neither is going to take a leadership role at Castle Black. Jon Snow turns over the Lord Commandership of the Night's Watch to Edd. Edd: "What do you want me to do with this?" I don't think that Jon can make Edd Lord Commander just like that. We've all seen that it needed some kind of election procedure for Jon to get the title. What he did was simply to temporarily give Edd command over Castle Black. Like what captains in Star Trek do when they leave the bridge. I don't remember if that happened before in the series, but in the books commanding power on the Wall and in Castle Black get passed around a few times, when commanding officers have to leave their post. Or is that cape some token of Lord Commandership? Still, I think Edd would have to be voted, right? Edd: "You swore a vow." Jon Snow: "Aye, I pledged my life to the Night's Watch. I gave my life." Randyll discovers Gilly's true origins as a Wildling from north of the Wall. Randyll: "Your way *down* to Castle Black? Where did he kill a White Walker? Where are you from? How'd you come to meet my son?" Gilly: "The Night's Watch came to our keep." Gilly: "North of the Wall." Alliser Thorne: "For thousands of years, the Night's Watch has held Castle Black against the Wildlings." Tormund: "The think you're some kind of God, the man who returned from the dead." Jon Snow: "I'm not a god." Edd: "Your eyes are still brown. Is that still you in there?" Jon: "I think so. Hold off on burning my body for now." Waif: "That's a short list. That can't be everyone you want to kill. Are you sure you're not forgetting someone?" Ramsay Bolton: "When my father became Warden of the North, your house refused to pledge their banners." Suggested special for Smalljon: 2x multiplier on insults. Night's Watchman: "Should we close the gate, Lord Commander?" Melessa Tarly: "Samwell, would you care for more bread?" Sam: "Oh, yes. Yes, please." Jon Snow: "Are you sure they'll come (the Wildling armies)?" Jon Snow: "We're digging trenches all along our flanks. They won't be able to hit us the way that Stannis hit you, in a double envelopment." Jon: "They won't be able to hit us from the sides." Davos: "I can never sleep the night before a battle." Tormund: "So what do you do all night?" Davos: "I walk. Think and walk. Think and walk until I'm far enough away from camp that no one can hear me shitting my guts out." Waif: "Who else was on Arya Stark's funny little list?"